William was a rancher for twenty-five of the thirty-two years he lived in California. He began as a hired manager for John Sutter (in top menus, see his First Years in California). Sutter put him in charge of Hock Farm then Fort Ross in 1843. William began renting Fort Ross in 1845, and bought it in 1851. He also, for a time, held interest in two other ranchos: New Breisgau and Rancho de German / Rancho Hermann. In 1844 William Benitz was granted Rancho New Breisgau, over estimated at 5 sitios de ganado mayor, it actually encompassed about 3.5 sitios - 15,300 acres (6,200 hec. ); it was located on the eastern shores of the Sacramento River straddling today’s county border between Tehama and Shasta counties. William didn't pay much attention to it; in 1846 the tenant Julian was killed by Indians; in 1850 he exchanged half-ownership with Ernest Rufus for Rufus’ share of Rancho Herman; by 1852 several squatters had made claims; in 1854 they lost ownership to 2/3 of it in the US land courts; and we believe that prior to Rufus selling New Briesgau in 1856, William gave him full title. In 1845, with partners Ernest Rufus and Charles Theodor Meyer, Benitz leased Fort Ross from Sutter (bought from the Russians when they left in 1841) and later that same year from Manuel Torres when the Mexican authorities rejected Sutter’s claim and granted Rancho de Muniz to Torres. Benitz and Meyer bought Rancho de Muniz from Torres in 1851 with a $5,000 promissory note; in 1855 Benitz bought out Meyer ($22,500); in 1857 he paid the note to Torres. In 1859 Benitz paid $6,000 to Sutter, Muldrew, et al for clear title to Fort Ross, which was not included in the original Rancho de Muniz grant. In 1860, the entire property was surveyed and patented as the Muniz Rancho at 17,760 acres (7,187 ha.). Today the heart of it is included in the Fort Ross State Park. In 1846 William Benitz and Ernest Rufus petitioned for Rancho de Hermann. Located between the Gualala River and the Pacific coast, they over estimated it’s size at 5 sitios de ganado mayor. The Mexican governor (Pico) granted Rancho de German to Rufus alone; Rufus promptly gave 1 league each to Frederick Hügal and Henry Haegler. In 1849 Benitz and Charles T. Meyer bought Rufus’ 3 remaining leagues (exchanged for $1,000 & a half share in Rancho New Breisgau) and obtained a quit claim from Hügal for his league. In 1853 Benitz and Meyer sold the combined 4 leagues, re-estimated at 2¼ leagues, and all livestock to William Bihler and Charles Wagner ($26,500). The entire rancho was surveyed & patented 30 July, 1872, at 17,580 acres (7,047 hec., about 4.05 sitios). 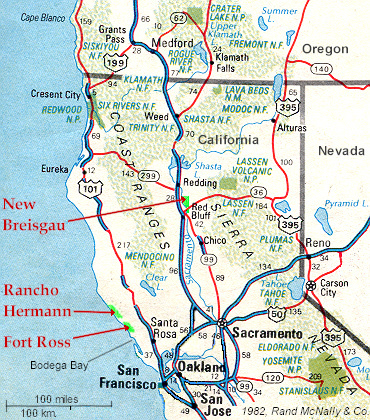 William also owned some smaller properties, bits of Rancho Agua Caliente (north of Sonoma) and Rancho Cañada de Jonive (at Freestone, south of Occidental). He may have bought them on spec as small investments, but he could also have used them as staging areas or rest stops for cattle herds on their way from Fort Ross and Rancho Hermann to market, e.g. Petaluma, from where sailing scows carried agricultural products to San Francisco. At that time there were no railroads in Sonoma county; they were built in the 1870's. In 1847, William Benitz and Ernest Rufus bought 640 acres (260 hectareas) of Rancho Agua Caliente. The property was in the valley about five miles north of the town of Sonoma, where William owned a house on the plaza and a small plot of land, likely a field in which to keep riding stock. William owned two lots at Rancho Jonive. The first lot was one Spanish mile square (195 hec., 482 acres). He bought it from Y.N. Neville, exact date unknown but after 1850, and sold it in November, 1857; about when he sold his properties in Sonoma and at Agua Caliente. The second lot at Jonive was much smaller, 16 by 80 chains (50 hec., 125 acres). He bought it in 1859; we don't know when he sold it. Rancho Jonive was where Freestone is today, south of Occidental and west of Santa Rosa.